Spacex has made modifications to the launch pad at Cape Canaveral. Musk: The extension to the existing hangar is for payload processing and it’s also for Falcon 9 version 1.1, which is longer. It’s about 50 percent longer than version 1. We need a little bit of extra length and some extra facilities for the satellites that are coming. NOTE: Falcon 9 v1.1 is an upgraded version of the Falcon 9 rocket with more powerful Merlin 1D engines and lengthened propellant tanks. It will also be the core for SpaceX’s Falcon Heavy, a colossal booster formed from three first stages strapped together. Falcon Heavy’s first test launch is expected as soon as mid-2013. Musk: We’ll certainly be vertical on the pad at Vandenberg [Air Force Base in California] by the end of the year. Launch could be early next year. 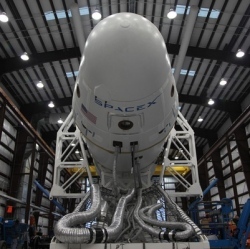 The launch date depends on how the final phase of testing goes for the next-generation Falcon 9. Musk: The next version of Falcon 9 will be used for everything. The last flight of version 1.0 will be Flight 5. All future missions after Flight 5 will be v1.1. We’ve got this mission, which is Flight 3. And we’ve two CRS [Commercial Resupply Services] missions, Flight 4 and Flight 5, which will fly Version 1.0. Then all future missions, CRS or otherwise, will fly Version 1.1. Musk: We expect to continue hiring at a high rate at SpaceX. We’ve grown on average about 30 percent a year. We might not continue growing at that level, but I expect to continue growing at 15 percent or 20 percent per year. We’ll be hiring hundreds of employees every year. That’s my expectation. Musk: Our goal is to revolutionize space transport. So we’ll be doing every kind of space transport, except for suborbital. We’ll launch satellites of all shapes and sizes, servicing the space station with cargo and crew, and then the long term objective is to develop a space transport system that will enable humanity to become a multi-planet species.